Just forgive me for posting again a chocolate mousse dessert, i couldnt stop myself as this chocolate mousse tart topped with eggless orange curd was our recent favourite. Yes this layered orange curd and chocolate mousse tart makes an excellent dessert as well if you are looking for something different for your dessert after meal. Orange curd and chocolate mousse, both makes excellent dessert when served separately. But these two ingredients makes an excellent dessert as well. We doesnt need any reason to prepare this utlimate tart eventhough the cooking and baking process asks for bit time consuming. You can bake the tart base earlier a day and then fill it with eggless chocolate mousse and orange curd the next day. Usually orange curd asks for eggs but my version of orange curd is completely eggless and very simple to dish out as well. 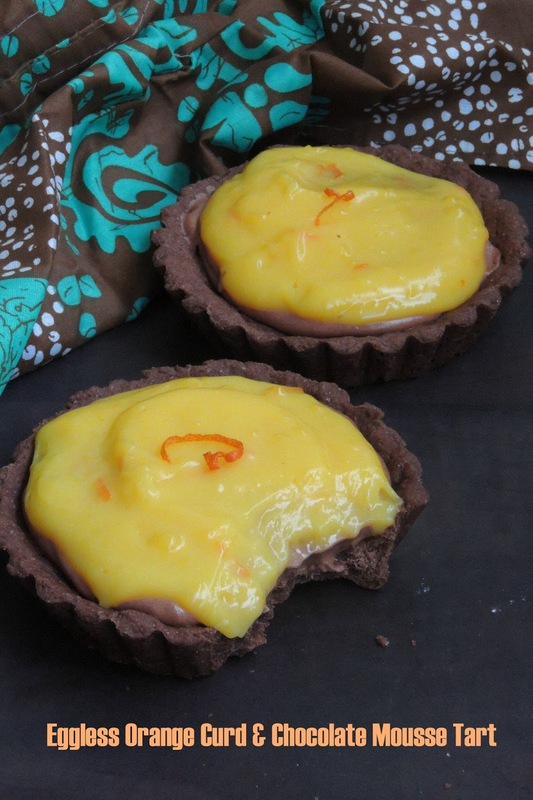 Once topped over an eggless chocolate mousse, both the mousse and orange curd makes an excellent filling to enjoy this chocolate loaded tart. Since i running this week's blogging marathon with Layered dish as theme, i dont want to miss a chance to post this tart as this tart suits prefectly for this theme. You can also replace very well the orange curd with just a chocolate ganache if you feel lazy to dish out orange curd. Just mix and match the filling for this tart and enjoy thoroughly. Pulse the butter and sugar together for few seconds. Add the flour,baking powder, salt and mix everything with fingers until they turns moist and crumbled like dough. Mix in the yogurt and turn everything as soft dough. Wrap the dough and arrange in fridge for an hour. Roll the dough between two baking sheet and cut as medium sized circles to fit your tart mould. Bake them for 10minute at 350F and let them cool completely. In a chilled bowl, beat the heavy cream until they turns smooth and stiff, keep it in fridge. Meanwhile take the chocolate chips and butter in a bowl. Put this bowl on the top of the simmering water sauce pan, make sure the water should not touch the bottom of the chocolate bowl. Melt the chocolate completely, stir continously and remove it,let it cool for few seconds. Now gently drop the whipped cream and slowly fold it. Dont deflate the whipped cream, take care of it. Transfer the mousse to a piping bag and keep in fridge for atleast an hour. Heat the orange juice, sugar, orange zest, salt in a small saucepan and stir cook until the sugar gets dissolved. Mix the cornstarch, milk,cold water together, keep aside. Now add corn starch mixture to the orange juice-sugar mixture and cook in simmer until the mixture starts thicken. Once the bubbles appear on the surface, add the butter and cook by stirring constantly until the mixture resembles like a thick spread. Transfer this mixture to a bowl, cover it with a plastic wrap and let it cool completely. Chill it for an hour in fridge before using. Pipe the mousse on to the chocolate tart shells. 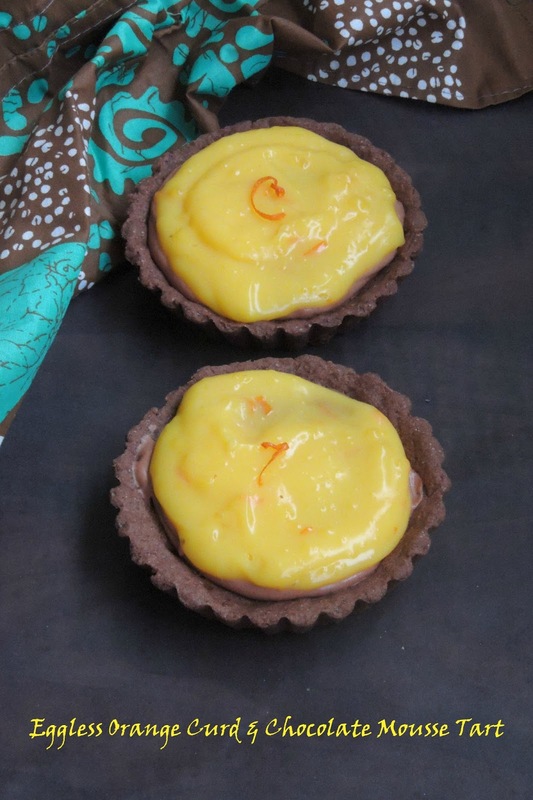 Then spoon the orange curd generously over the chocolate mousse and arrange the tart in fridge atleast for an hour. The dessert sounds delicious , orange and chocolate combo is absolutely awesome . 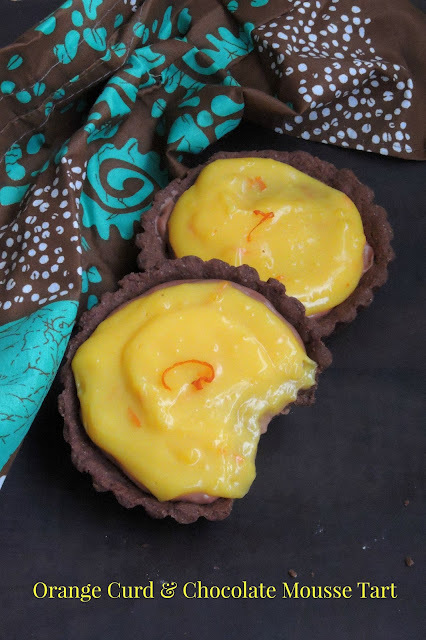 Wonderful looking tarts.Bookmarked to try soon..
love these yummy little cuties. The orange curd just took away the show for me ..Loved it.